When is the Fitness Pool available for open swim? 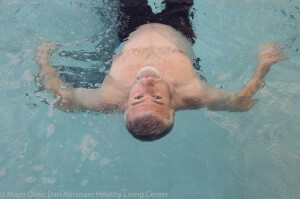 Members may use the fitness pool anytime classes are not currently being conducted or when only a portion of the pool is being used for classes (indicated by a roped off section of the pool). The current Open Pool schedule can be found on the Group Fitness page within the PDF resource listing (found on the left-hand side of the page). Click here to access the Group Fitness page.